Speakers include: Imdad Qazi, Justice (rtd) Fakhrudin G. Ebrahim, Wahid Bashir, Nasir Mansoor, Hassan Nasir, Dr Humayun Bashir, Dr Habibur Rehman Soomro, Dr Nisar Shah, Iqbal Alavi, Manzoor Razi, Fareed Awan, Ayub Qureshi, Khursheed Abbasi, Mrs Ilmia, and Sania Saeed. Photos by the photographer and musicologist S.M. Shahid, taken at the Arts Council in 1980 or so, when Ali Sardar Jafri and Ismat Chughtai visited Pakistan. Also photographed is the late poet Suroor Barabankvi, the prominent jurist Fakhruddin G. Ebrahim along with Dr M. Sarwar and Zakia Sarwar. The well-known television anchor Mujahid Barelvi is visible in one of the photos. Eminent jurist and former governor of Sindh, Justice (Retired) Fakhruddin G. Ibrahim said on Sunday it was high time a “left-oriented” think tank was established in Pakistan. Speaking at a memorial meeting for the late Dr Mohammad Sarwar at the PMA House Sunday evening, he said people said that Pakistan was a failed state but one should remember that it was the establishment and not the people of Pakistan who had failed. “Things are changing for the better,” he said. “I don’t know what’s wrong with us. Religion has become a cause of killing,” he remarked. He said people were ready to listen today and this was evident from the fact that there were few people around when the Judges’ movement kicked off but it culminated in a huge success. He said it was time to live up to the ideals of Dr Sarwar since “it’s our time to say.” He said the people of Pakistan needed a new leadership since the old leadership had failed totally. He said Dr Sarwar fought for a just society, a society free from exploitation and it was time to create a just society. Dr Badar Siddiqi, former General Secretary of the Pakistan Medical Association (PMA) said death was more universal than life because every body dies but there are people who live on even after they’re gone through their noble deeds and universal love. Dr Sarwar, he said, was one such person who strove for the establishment of a just society. He said Dr Sarwar established the Democratic Students Federation (DSF) that happened to be the first students’ organisation in Pakistan. Thereafter, he also established the All- Pakistan Students Organisation (APSO) and the Inter-Collegiate Body that comprised students unions from across the country. Dr Siddiqi pointed out that Dr Sarwar led the historic 1953 student movement that forced the authorities to accept many demands of the students, including the establishment of the University of Karachi. He said Dr Sarwar was injured when police resorted to firing on a student’s procession on January 8, 1953 in which seven students and a child were killed, and he also was arrested. He said after he was released from jail, he along with his colleagues, including Dr Adib-ul-Hasan Rizvi, Dr Syed Haroon Ahmed, Dr Moinuddin Ahmed, and Dr Jaffer Naqvi played a vital role in the affairs of the Pakistan Medical Association and transformed it into a strong and dynamic force. He said Dr Sarwar struggled for provision of health cover to the people and was never overwhelmed even by ferocious dictators such as Gen. Ziaul Haq while negotiating on behalf of PMA. “I will not classify him as an individual; he was an institution,” he said. He said the number of people who visited Dr Sarwar’s residence was unbelievable and they included Faiz Ahmed Faiz, Syed Sibte Hasan, Habib Jalib, Zohra Nigah, Ali Imam, and Bashir Mirza, just to name a few. Former student leader Mairaj Mohammad Khan said Dr Sarwar was an institution whose roots were very deep in society. He said 1953 movement led by Dr Sarwar was not confined to the students but impacted the entire society. “It was movement to change Pakistani society,” he said. He said the DSF was banned in 1954 because it was against imperialist military pacts and was against a dependent economy. Prof. Dr Jaffer Naqvi said Dr Sarwar was a phenomenon and a staunch enemy of dictatorship. Prominent singer Tina Sani sang a poem of Faiz Ahmed Faiz. Messages of Asif Hameedi, Eric Rahim, and Dr Mangi who are abroad were also read at the ceremony. A six-minute documentary on Dr Sarwar was also shown in the programme. KARACHI, May 31: Tributes were paid on Sunday to a pioneering former student leader, Dr Mohammad Sarwar, who struggled for the rights of students, workers and the downtrodden masses. Friends and admirers of the late Dr Sarwar belonging to different walks of life, including law, engineering, literature and the fine arts, spoke of their association with the late general practitioner at a meeting organised by the Pakistan Medical Association at the PMA House. 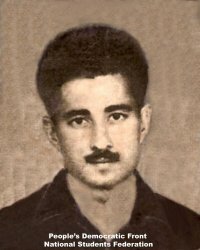 Former Sindh Governor Fakhruddin G. Ebrahim, who as a young lawyer had defended Dr Sarwar and many of his comrades in the 1950s, said that Dr Sarwar founded the Democratic Students Union in the early 1950s because he felt students adopted the “politics of idealism”, and he also created a body that linked all students in other educational institutions in the city together, so that “principled politics could be strengthened in the newly born country”. Unfortunately, however, first the DSF was banned and then succeeding governments banned student unions altogether for many years, Mr Ebrahim said. He said that the “old leadership has failed and it is high time that a new leadership, believing in high ideals, emerges to lead the country and bring justice to society. He said equal rights for all must be ensured. Mairaj Mohammad Khan said that Dr Sarwar was a “true progressive”, having a broad minded and secular way of thought, he “respected religion but was against this kind of interpretation of religion under which women were lashed and people were beheaded”. Dr Jaffer Naqvi said that people could have a discussion with Dr Sarwar for hours and while they may continue to disagree with him, he would always listen attentively and was so tolerant that would never get angry or raise his voice. In an interesting revelation, Arif Hassan said that the government had originally prepared a master plan of the city in 1951, with the proposed federal government buildings located opposite the university. When the DSF brought students into politics, however, and took to agitations and protests against the government, voices were heard in cabinet meetings calling for a change in the proposals, to relocate the federal government buildings. Eventually, he said, Ayub Khan moved the federal government apparatus over 1,000 kilometres away. Aziz Tank, Samreen Hashmi, Badar Siddiqui and others also spoke while Arshad Mehmood, Tina Sani and Atiya Dawood recited poetry. A few documentaries on interviews and discussions with Dr Sarwar were also screened.